This article on the British Mountaineering Council website provides a valuable explanation of the essential equipment required to do vie ferrate safely. Climbing the Via Ferrata Brigata Tridentina. An overview of via ferrata equipment, techniques and safety from the blog of the shop Rock+Run. It also includes a few notes on children doing via ferrata. A great and comprehensive website that provides route descriptions and photographs of many via ferrata in the Italian Dolomites. An interactive via ferrata map is a useful tool for planning a trip and routes are also listed by mountain group and name. A brilliant website that provides very detailed and clear route descriptions of vie ferrate in the Italian Dolomites. A search function allows you to look for via ferrata by mountain group and name. Route descriptions can also be downloaded as pdf files so you can print them off and take them on the mountain with you. The Planet Mountain site is available in both English and Italian and contains lots of other information on mountain activities. 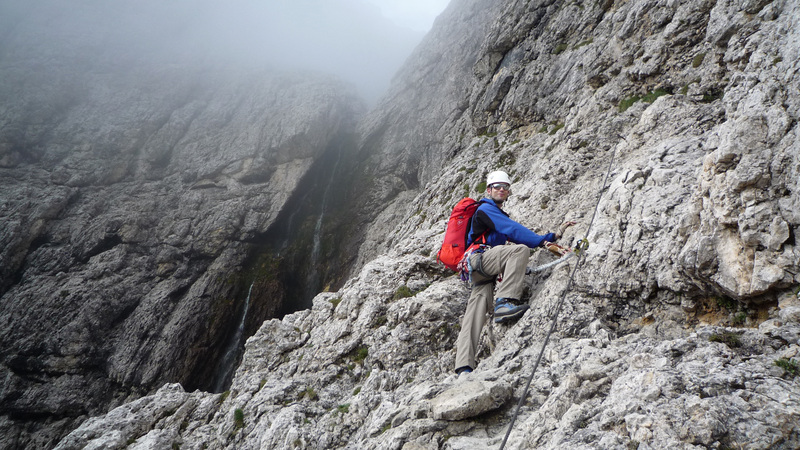 On their website the tourist authority of South Tyrol describes via ferrata in their region. The summaries of the via ferrata are short, but each helpfully includes a topographical map showing the route together with an altitude profile of the route. A German language website that provides descriptions and photos of via ferrata across Europe. It also has via ferrata news, technical advice, articles, useful links and information on equipment. An Austrian website that provides brief descriptions and photos of vie ferrate in Austria, Germany, Italy and Switzerland. The majority of the website is in German, but the introductory pages (including an explanation of one system of vie ferrate grading) is in English. The best thing about this German-language website are the interactive maps that allow you to find descriptions of via ferrata across Europe. The descriptions often include photos, topos, commentary and descriptions. Unfortunately, the amount of information can vary and is often less than other websites. A nicely set out, German-language website that provides route descriptions, maps and topos for via ferratas in Austria, Switzerland and Italy. A well-designed and useful Spanish language website that provides information on vie ferrate in Spain and France. There is an interactive map of Europe marking each via ferrata as well as route descriptions, photographic topos, photos, local maps and some videos. A French language website that provide short descriptions of French vie ferrate and articles on such things as via ferrata safety. A free app that provides information on via ferrate in the Ecrins and Briancon area of the Haute Alps in France. It includes topos, route maps, photos, mapping, access information and descriptions of the routes. It’s available from the Apple App Store and Google Play. On the website of Switzerland Tourism there are descriptions and photos of many of the vie ferrate in Switzerland. An article briefly summarising the vie ferrate in the USA. Hi. Thought I just might add one more useful link for those climbers traveling to or inside Europe and looking for ferrata routes in different states. Try Goferrata.com, simple and usefull search engine I came across recently. In my opinion, it has the best layout amongst other similiar services out there and provides very decent database of tracks, mainly those in the Alps. You can also filter the matches according to difficulty or lenght. Nothing really unique, however, as I said, the user interface is really nice, which made it the right option for me. It’s an interesting site. It’s a well-designed interactive map of European via ferrata and would be really useful for planning a trip. However, as a non-German speaker, I think it’s a shame that it doesn’t have links through to English language descriptions of the routes. Hi there — chipping in to this thread very late, but you seem like the right person to ask. I have had some experience with via ferrate but always using rented equipment or kits borrowed from friends. I want to buy my own now but am finding it surprisingly difficult to find comprehensive safety reviews of different kits (perhaps the language barrier you have mentioned?) I was wondering if you 1) know the right place for me to look to find safety standards/reviews and 2) have a recommendation of your own favourite. That would be very helpful — thanks! Hi there — chipping in very late to this thread, but you seem like the right person to ask. I’ve had a bit of experience with via ferrate but always using rental equipment or kits borrowed from friends. I’m now wanting to buy my own kit but I’m finding it surprisingly hard to find comprehensive safety reviews of what’s on the market (possibly due to the language barrier you mention?). I was hoping you might have either 1) a good source of such reviews or 2) a personal favourite to recommend. Thanks so much! I wish I did, but I’m afraid that I’m not aware of anyone doing such comprehensive reviews. Considering how many people do via ferrata, it’s a bit odd that no one seems to be writing them. A Google search comes up with the odd review of via ferrata sets, but nothing I would describe as a comprehensive review of lots of different sets. I’ve only ever owned two sets of via ferrata lanyards – a set by Edelrid and a set by Mammut. The Mammut set I’ve reviewed on this blog. The Edelrid set I haven’t reviewed here, but I thought it was very good. Edelrid and Mammut are probably the manufacturers I’d look to first the next time I’m buying some lanyards.